Customers enjoy a cool beverage at Minus5 Ice Bar in Las Vegas, where everything is made of ice. (CNN) -- Check out these five cool places to grab a cocktail. A coat and gloves are a must at these ice bars. Cool off from the casinos with a drink you can bet on. Everything inside this watering hole is made of ice. The staff changes the sculptures every few months to keep things fresh. Sometimes the pieces reflect what's happening in Las Vegas, such as an ice bull for the Professional Bull Riders event. Guests are provided with insulated jackets to stay warm and can unwind on ice couches covered with deer skin. What to drink: Sip on a wide range of vodka cocktails served in custom-designed glasses made from frozen New Zealand artesian water. 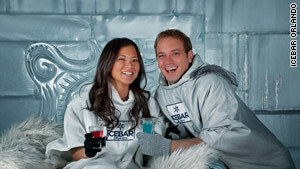 Address: Minus5 Ice Bar is at Mandalay Place in the Mandalay Bay Resort and Casino, 3930 Las Vegas Blvd. South. You might feel like royalty at this chilly bar on Heddon Street in the former wine vaults for the British monarchy. The carved ice inside is harvested from the Torne River in northern Sweden. 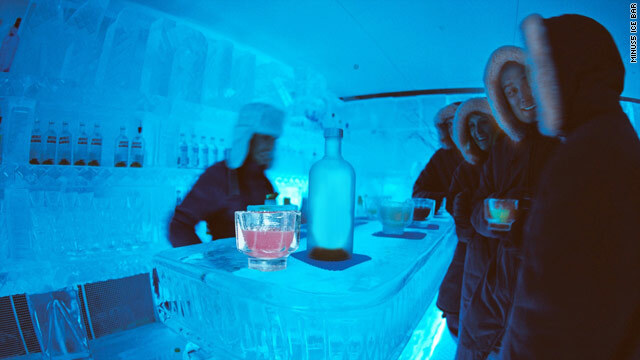 This establishment is touted as the UK's only permanent bar made of ice and is kept at 23 degrees Fahrenheit. Drink glasses are entirely made of ice, so your order is "in the rocks, not on the rocks." What to drink: Enjoy rum, vodka, whiskey, gin, tequila and champagne cocktails. 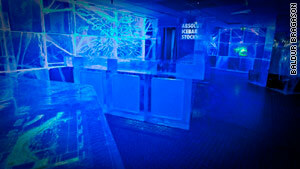 Address: Icebar London by Icehotel is at 31-33 Heddon St. in London's West End. After a day at Orlando's major theme parks or other tourist attractions, cool down with an icy beverage here. Inside this 27-degree Fahrenheit establishment, you'll discover 50 tons of exquisite ice sculptures enhanced with lights and music. Cozy up at the bar and order a drink from one of the many bartenders bundled up in coats and gloves. One of the top ice sculptors at Icebar Orlando is Aaron Costic, who has several world championship ice-carving titles. What to drink: Sip on Pinnacle Vodka. The bar carries 22 flavors, including whipped cream, which is the main feature inside the lounge. Address: Icebar Orlando is between SeaWorld and Universal Studios in the I-Drive tourist corridor at 8967 International Drive, Orlando. You'll do more than drink in this ice bar. Visitors get to watch a 3-D movie made especially for XtraCold. The show takes you on a journey through clouds, under water and around ice mountains. As the name of the bar suggests, everything inside XtraCold is made from ice, including the walls, bar, chairs and glasses. In total, they use 40 tons of ice to build this cool place. LED lights with a rainbow of colors brighten up the space, and music keeps you moving so you can stay warm. What to drink: Chug a cool glass of Extra Cold beer from Heineken. Address: XtraCold Amsterdam is in the heart of the city at: Amstel 194-196, Amsterdam 1017, the Netherlands. 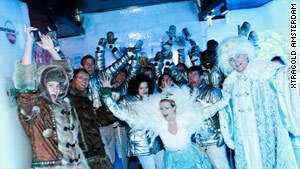 This year's theme takes visitors on an expedition into the icy depths of the ocean. The owners say you're invited to step aboard and "submerge into an abyss of cool." Everything inside this bar is made of crystal-clear ice from the Torne River. Keep warm with a cape and gloves this establishment provides for your comfort. The lounge is in the heart of Stockholm and walking distance to major sites. What to drink: Enjoy an Absolut vodka cocktail. 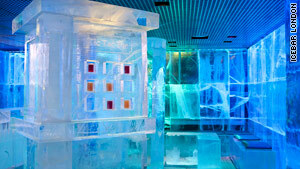 Address: Entrance to Absolut Icebar Stockholm is inside the lobby of the Nordic Sea Hotel, Vasaplan 4, Stockholm, Sweden. An early blast of snow is translating into a blast for skiers and snowboarders. Here's where to go. Why would you pay to jump into freezing-cold water? We look at the five biggest Plunges in the United States. From the Maldives to Macau, escape to these restaurants for a healthy helping of stunning scenery. A trip to Walt Disney World usually conjures up images of summer vacation, but it turns out late fall is the perfect time to go. Travelers looking to clean up will find that blowing bubbles in these tubs is definitely not kid's stuff.